Jet Airways, which operated a fleet of 123 at its peak till a few months ago, is now flying only five aircraft due to lack of funds to remain operationally afloat. Even as airlines add capacity and mount additional flights from top airports such as Mumbai, Delhi and Bengaluru, the curtailment of schedule of Jet Airways — India’s second largest carrier till a few months ago — has resulted in significant capacity reduction in the Indian aviation market leading to a 19-36 per cent increase in fares on average. The issue was raised in the top corridors of the government, with Minister of Civil Aviation Suresh Prabhu asking Civil Aviation Secretary Pradeep Singh Kharola to review issues related to Jet Airways, especially increasing fares, flight cancellations etc. Earlier during the day, officials of the Directorate General of Civil Aviation (DGCA) met various airline representatives to discuss the fare increase issue. A senior DGCA official said that the aviation regulator was monitoring domestic fares on a daily basis, particularly on high density routes and those where alternate mode of transport was not available. “… airlines were advised to continue to monitor at their level and provide information to DGCA to keep fares low as far as possible. Representatives also intimated DGCA that they have removed the few higher buckets from sale and are offering tickets to passengers in lower fare buckets. DGCA will continue to monitor fare movement on daily basis and engage with airline for appropriate action,” the official said. Following a meeting with the DGCA, airlines and airport operators on Tuesday evening, Kharola told reporters that an estimated 10 aircraft are expected to be added over the next month. He added that 90 per cent of Jet Airways’ unused slots are lying vacant across the country and are being reallocated temporarily. Kharola also said that the DGCA was monitoring 40 sectors everyday for fare increases, of which 10 sectors witnessed an increase of 10-30 per cent in fares. Meanwhile, as its unused slots get reallocated, rival airlines including IndiGo, SpiceJet, Vistara, AirAsia India have announced flights from airports such as Mumbai and Delhi. Temporary reallocation of unused slots is something that was done in 2014 as well, when low-cost carrier SpiceJet was nearing a shutdown and cancelled flights across India. The airline received fund infusion at the end because of which it was able to survive. Industry watchers suggest that IndiGo was the biggest beneficiary of SpiceJet’s vacated slots in 2014. For the Mumbai airport — which is the most congested airport in the country — slots have been unavailable due to lack of infrastructure expansion possibilities of the airport. Aviation analysts have said that a second airport, which is coming up at Navi Mumbai, will be imperative to release the pressure on the existing airport. The last time slots were made available to other airlines on a non-temporary basis was back in 2012 after Kingfisher Airlines folded up. Tuesday, India’s largest carrier IndiGo announced addition of 18 flights from Mumbai and Delhi to various destinations such as Chennai, Bengaluru, Ahmedabad, Varanasi, Bhopal, Lucknow and Ranchi among others. SpiceJet, earlier in the day, announced induction of five Bombardier Q400 turboprop aircraft to augment its capacity. “Sharp reduction in capacity over the past two months has led to an increase in fares across key sectors. 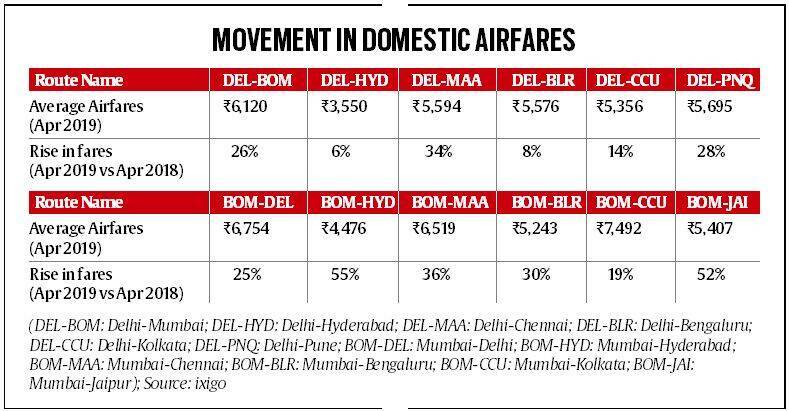 We have seen an increase in fares for the month of April by 19 per cent and 36 per cent for flights originating from Delhi and Mumbai as compared to the same time last year. Induction of new planes by airlines and announcement of new international flights from cities like Mumbai will hopefully bring down flight cancellations and help capacity expansion before the peak summer travel season hits,” said Aloke Bajpai, CEO and co-founder of travel portal ixigo. Further, the Civil Aviation Secretary informed that the Ministry would convene meetings of representatives of airlines and airports on April 18 to discuss capacity expansion, rising airfares and other issues.